This guide is for the 1975 Digital Games Inc. game. For the 1982 KKK game, see Knock Out!!. 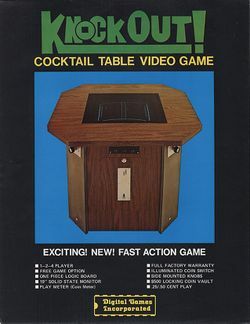 Knock Out is: Digital Games Inc.'s very first arcade game (released in 1975); it is based on Atari's Pong which was released three years earlier. Up to four players must use their rotary controllers to take up the vertical movements of four (vertically-oriented) paddles in one of three different modes. This page was last edited on 16 April 2014, at 00:34.